Relying on an amazing support team. Encrypting your email with SecureLineTM. Going dedicated to maximize reliability & security. Scan for: Viruses, content, attachments, links, etc. Secure your ePHI during email communications. Dedicated servers are required for accounts with 50+ email users. Shared accounts support up to 500 GB of storage space, total, for all email belonging to all users in the account. Dedicated servers and clusters can have a potentially unlimited storage capacity. 50 GB of disk space comes included with shared accounts. 25-100GB comes included with dedicated accounts (depending on how large/powerful the server chosen is). You can purchase additional blocks of disk space as needed. HIPAA-compliant email accounts need SecureLineTM email encryption, email archival, and premium email filtering. I have been very happy with LuxSci -- I especially like the peace of mind I have regarding HIPPA compliance and the privacy of my sensitive information. The product is easy to use and does what I need." It's unfortunate that hackers can exploit online communications on the hunt for sensitive information. However, with advanced cybersecurity, you can protect your private email information from hacking and vulnerabilities. At LuxSci, we specialize in email encryption to ensure communication security. Not only are our email services encrypted, but they're also HIPAA- (Health Insurance Portability and Accountability Act) compliant for those in the medical and Healthcare fields. Medical records hold some of your and your patients' most sensitive information: Social Security numbers, insurance IDs, addresses, credit cards, medical records and scheduling details, etc. LuxSci provides the leading service in HIPAA-compliant email, which guarantees the privacy of all ePHI (electronic patient health information) sent within your organization, as well as to patients and other appropriate, outside recipients. HIPAA makes it your legal responsibility to secure your patients' ePHI, and it's our responsibility to provide those securing services. Complying with HIPAA can overwhelm and confuse when you're trying to find a user-friendly platform. LuxSci is here to make this easy for you. We provide HIPAA-compliant email with form processing and web hosting options. We also help back up your data and offer extensive auditing capabilities. Most important, we offer forced email encryption which comes with a verified seal that links to us and allows your recipients to know that you have properly protected their information. What kind of support does LuxSci provide? What email security features does LuxSci have? What programs & devices does LuxSci work with? Do I have to download something? LuxSci email works with any email program on any computer or mobile device, including Outlook, Mac Mail, Thunderbird, and the default email programs in iOS and Android. LuxSci email and SecureLineTM email encryption work through secure IMAP, SMTP, POP connections. There is never any need to download special programs, apps, or plugins. Additionally, LuxSci provides an option for using ActiveSync for real-time synchronization of email, contacts and calendars with your mobile devices and recent versions of Outlook for Windows. Are email messages backed up? Daily and weekly snapshots also protect your sensitive data against server failure, and we can always restore all your data. (Read more on LuxSci infrastructure and reliability). Dedicated server customers can request special/custom backup schedules. LuxSci also offers Email Archival for saving copies of all inbound and outbound email. These copies cannot be edited or deleted by anyone and they do not expire. Dedicated server customers can get from 10 GB up to 10 TB of space per server. Dedicated is the way to go if you have large-scale storage needs. What are the limits for email sending, receiving, etc.? LuxSci permits you to send and receive email messages that are up to 200 MB each (for customers with Email Archival, the limit is 50 MB/message). Email hosting customers can send up to 300 email messages/day; customers can send each message to up to 1000 recipients. These messages are not for use with bulk emailing of any kind. For email marketing and large-scale sending needs, we offer a separate High Volume Secure Sending service. We can add this additional service (and the associated cost) to your email hosting account. There's no explicit limit on the number of messages that you can receive. However, the receipt of large quantities of messages all at once (many 100s or 1000s of messages at a time, for example) can cause your inbound email to suspend automatically to protect our servers from inbound email abuse and "mail bombs." If you need to receive large numbers of messages in a short time, LuxSci provides dedicated inbound email processing servers. There are no limits on the number of users who can be in your account or the number of addresses you can have in your address book. We don't limit the number of messages you can store in your email folder. It's important to note, however, that larger folders are slower to use than smaller folders (more than 100,000 messages would be extremely slow) and no email folder can contain more than 1 million messages. The majority of our servers are located in the state of Texas, USA. Customers ordering Business class dedicated servers can request that their servers be in other areas of the USA, London, Sydney, or Hong Kong. How do I move my email to LuxSci? Can I send HIPAA-compliant email to anyone? Yes. LuxSci SecureLineTM enables you to send compliant email to anyone with an email address. Your recipients do not need to use LuxSci themselves. Can recipients of my secure messages reply to me? Yes. Recipients of your secure email messages can reply to you. Do I get a trustmark or seal for my website and email? In addition to email encryption, HIPAA-compliant email hosting accounts include email access and sending from email programs (e.g. using IMAP, POP, and SMTP) and from our Web interface. LuxSci also highly recommends use of our Email Archival, Premium Email Filtering, and Mobile Secure Chat. Can we opt in or opt out of encryption for some messages? If some messages do not include ePHI, you can choose to opt out of using encryption for them. LuxSci does not support opt-in encryption (where you manually specify which messages need encryption) for HIPAA-compliant accounts, because it's too risky for HIPAA compliance. We do support Opt-In encryption if you do not need HIPAA compliance. What if only some users need to send or receive ePHI? If only some people need to send ePHI, we can segregate your users into two (or more) domains. For example, users who must be fully compliant can have addresses in "secure.yourdomain.com." Users who do not need HIPAA-compliant email can have addresses in "yourdomain.com" and can send and receive without any encryption at all. (We call this per-domain HIPAA compliance.) Users can have addresses in both domains, if needed. When and where is the email encrypted? When you send an email message through WebMail, from either your mobile device or your email program, that message is transmitted securely to LuxSci's servers using TLS. Once the message arrives, LuxSci encrypts the message for each of your recipients and then delivers the encrypted message to the recipient's email servers. Based on your account preferences, who the recipients are, where their email host is, and settings in your account, the encryption used can take the form of: SMTP TLS, Secure Message Pick Up (Escrow), PGP, or S/MIME. The type of encryption used is dynamically determined at send time. Is email encrypted at rest? Yes, it can be. It depends on your choice of account settings. See Ensuring all data is encrypted at rest with LuxSci. Do recipients need to enter a password to open their message(s)? It depends. Messages sent using SMTP TLS do not require anything special to open them since they're encrypted only during transmission. Messages sent using Escrow (Secure Portal Pick Up) do require the recipients to authenticate themselves to our secure web site in order to access their secure messages. You can do this either (a) by using a username/password for a free account to access any received message, or (b) by providing an answer to a custom question designated by the message sender. See: SecureLineTM Escrow and SMTP TLS. HIPAA compliance requires that the transfer of any sensitive or confidential patient health information (ePHI) over the Internet is done securely. Our SecureLineTM email encryption system is designed to do just that. SecureLineTM seamlessly and dynamically integrates the following modes of secure email transmission to ensure that you can securely communicate with anyone, no matter what email system they have. SMTP TLS - SMTP TLS enables mail servers to transfer email between themselves in a secure manner, even if the messages themselves are not internally encrypted. TLS provides secure email delivery to recipients whose email servers support TLS (which includes about 85% of recipients). LuxSci fully supports TLS and uses only NIST-recommended protocols and ciphers. SecureLineTM Escrow - SecureLineTM Escrow requires that a recipient actively verify his or her identity before s/he can access a message via a secure web portal. Escrow provides secure email delivery, authentication, storage, transmission, and auditing for messages to anyone with an email address. Which is better: TLS or Escrow? SecureLineTM PKI - SecureLineTM PKI uses public key certificates (PGP and/or S/MIME) to internally encrypt email messages before sending them to the recipients. The recipients must also be using PKI for this method to be useful. HIPAA requirements are extremely vague and decisions on risk, security, usability and applicability are generally in the hands of each individual organization. As such, LuxSci's email security system is uniquely flexible, allowing you to "dial in" where you need to be on the spectrum from high usability to high security. Dynamic TLS: LuxSci determines dynamically, at the time of message delivery, which of your recipients support TLS and which do not. For those that do not, LuxSci automatically falls back to Escrow or PKI for secure message delivery. You do not have to pre-configure anything to use TLS to the maximum degree possible. You also do not have to worry about messages being delivered insecurely to people who do not support TLS. Exclusive TLS: When the ease of opening email messages is more important than email delivery (e.g., for email marketing), TLS Exclusive is appropriate. With this technology, Dynamic TLS is used to determine which recipients will get your messages securely over TLS. Messages to everyone else will be automatically dropped. This is ideal for securing all your email using TLS, while not annoying the 10-15% of recipients using poor email systems with portal-pickup email messages. LuxSci requires a signed HIPAA Business Associates Agreement (BAA) and a signed Account Restrictions Agreement (ARA) in order for LuxSci to be considered your Business Associate and for us to consider your account HIPAA compliant. When you sign up for HIPAA-compliant email, SecureLineTM ensures that all email messages sent via SMTP or through our WebMail interface are sent securely, while remaining flexible enough to allow exceptions where appropriate for usability. The chart below shows how SecureLineTM can be adjusted to fit the scope of your compliance. Never Full account-wide lockdown. All users are required to send securely. Insecure sending is entirely prohibited. Occasionally for some users Account-wide lockdown with opt-out enabled. All users are required to send securely, but certain users are permitted to opt-out on an individual message basis. All opt-outs are logged. Occasionally for all users All users have logins to two separate domains — one for secure sending (typically a subdomain), and one for non-ePHI sending. The secure domain is completely locked down to prohibit non-ePHI sending. Never Majority of users have logins in a non-HIPAA domain, while the few that send ePHI have logins in a different HIPAA-secure domain (typically a subdomain). The secure domain is locked down to prohibit non-ePHI sending. Occasionally Majority of users have logins in a non-HIPAA domain, while the few that send ePHI have logins in a different HIPAA-secure domain (typically a subdomain). The secure domain is set to allow opt-outs. All opt-outs are logged. Your security settings are locked down as soon as your account is created. Once we have your signed BAA and ARA, LuxSci gives your account a final review to make sure everything is in order. At this point your account is considered HIPAA-compliant. Beyond email sending, LuxSci ensures compliance of your email and other data (e.g. WebAidesTM, Widgets, etc.) per the terms of our Business Associate Agreement with you. 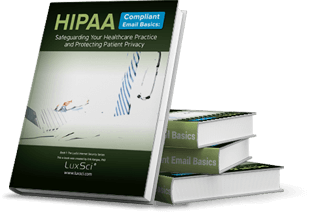 LuxSci's HIPAA-compliant email was specifically designed to satisfy all HIPAA rules and security requirements. With the implementation and utilization of the following features, and after review and lock down by LuxSci Support, we will confirm your account as being HIPAA compliant in terms of our HIPAA Business Associate Agreement. LuxSci provides a Business Associate Agreement compatible with the HITECH amendments of HIPAA. This defines LuxSci's role in maintaining the Privacy of Protected Health Information (PHI) for you as you seek to be HIPAA-compliant. A document like this is required by HIPAA of any vendor that you use. 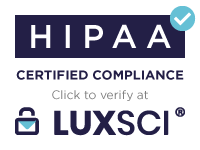 Once your account is certified by LuxSci as meeting its HIPAA Security Requirements, you can use a LuxSci HIPAA Compliance Seal on your web site or in your HTML Email Signatures, Taglines, or Disclaimers. HIPAA accounts can be either globally secure, so all users are compliant and encryption and security are fully-enforced for all messages, or they can be secured on a per-domain basis. In the per-domain case, only users in specified "HIPAA Domains" are required to send all email securely; users in other domains can send insecure email messages but cannot deal with ePHI at all. All users in these accounts share certain basic security considerations such as strong passwords, required use of SSL and TLS for server access, etc. Use of per-domain HIPAA allows organizations to easily manage their compliant and non-compliant domains in a single account and also permits limited collaboration and sharing between non-HIPAA and HIPAA user logins. Customers can select account-wide or per-domain HIPAA accounts during the ordering process. I.e. LuxSci staff themselves obey all of the same HIPAA Security and Privacy requirements that our customers face when dealing with ePHI. CalDAV and CardDAV and standard prorocols for synchronizing calendars and contact lists with desktop and mobile devices. macOS and iOS devices, in particular, and excellent support for synchronization using these protocols. For Android and Windows, third-party applications (including Mozilla Thunderbird) also support them. CalDAV and CardDAV access is included at no additional fee for all email customers; MobileSync is not required. MobileSync is an optional Exchange ActiveSync service that enables you to synchronize email, calendars, contacts, tasks, and notes on your mobile devices automatically and in real time. Mobile Sync is HIPAA-compliant and provides "Remote Wipe", so you can delete ePHI from your mobile device should it become lost or stolen -- preventing possible HIPAA breaches. Even without Mobile Sync, LuxSci's IMAP, POP, and SMTP services can be used to securely send and receive email on most mobile devices. Redundant storage in 2 different locations. Retention of email for 30-days to 10-years. 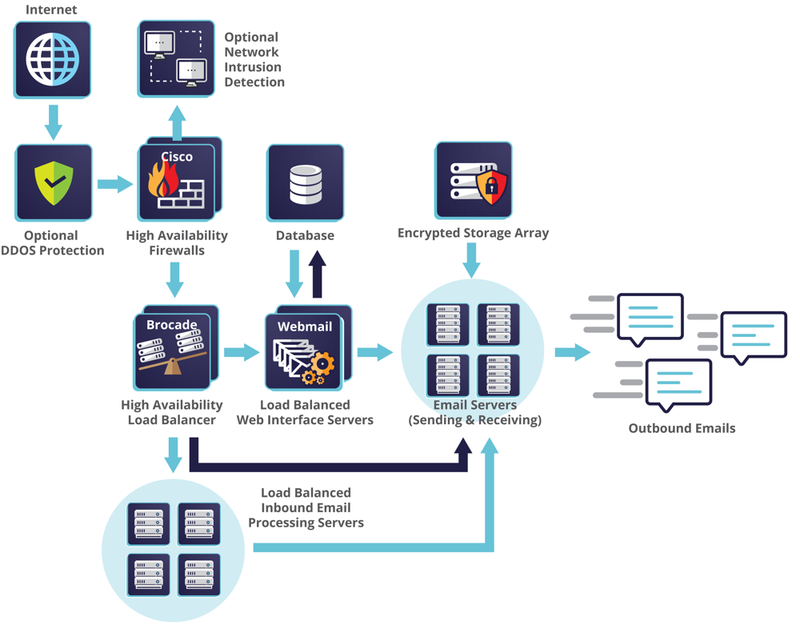 In addition to enforced use of SSL and TLS for all connections to our servers, all users automatically send and receive email securely using our SecureLineTM end-to-end encryption service. All outbound messages sent via SMTP, WebMail, or Premium Mobile Sync will be automatically encrypted. Additionally, SecureLineTM allows your users to send secured messages to anyone with any valid email address, even if they do not have TLS or S/MIME or PGP support. Those recipients can easily reply back securely or use our SecureSend portal to register for free and initiate secure messages to your SecureLineTM users. To provide a user-friendly environment, certain work-arounds are possible, such as the use of TLS transmission for certain recipients instead of end-to-end encryption. See Restrictions to HIPAA Accounts at LuxSci. LuxSci's SecureLineTM and enforced connection encryption (SSL & TLS) ensures that the messages cannot be modified while in transit. Message integrity is assured. Additionally, LuxSci's SecureLineTM permits the addition of digital signatures to encrypted messages to further ensure the message integrity and prove the identity of the sender. LuxSci requires that user names and passwords be entered for access to any of its services. The system recognizes users based on their login information, and controls access based on their identity. HIPAA-compliant accounts are required to utilize a high level of password complexity: 8 characters consisting of letters and numbers or symbols. The password must have "high entropy" and not be easily guessable. Automatic auditing of password changes and password resets is required and performed for HIPAA accounts. LuxSci provides a facility for securely archiving copies of all inbound and/or outbound messages for backup and auditing purposes. Administrators thus have secure access to copies of all message content for emergency or other reasons. LuxSci also provides other optional features such as Message Continuity that is used to ensure access to email messages in the event of LuxSci server or data center failure. HIPAA compliant accounts have a 20 minute default idle period to web-based interfaces (WebMail). The system will automatically log users off after 20 minutes of inactivity; this can be increased to 3 hours by account administrators. Other services such as POP, IMAP, SMTP and Mobile Sync also have automatic idle timeouts. LuxSci provides comprehensive security auditing for all accounts. Included in the security audits are password changes, resets, and lookups by LuxSci staff; user access to services such as WebMail, Email Sending (SMTP), POP, IMAP, Mobile Sync, and more; changes to any of the specific "Maximal Security" settings, as well as changes to the "Maximal Security" lock down status. These reports enable verification of user, administrator, and LuxSci Support staff activity on access and security specific changes to the account. LuxSci automatically makes backup copies of all data on our servers, including all customer ePHI. Daily backup copies are kept on-site for 2 days and Weekly backup copies are kept off-site for 4 weeks. All data is transmitted securely to the backup servers and stored there in a HIPAA-compliant way. After 4 weeks, all backup copies are destroyed. Accounts can ask for data to be restored from backup for free once/month. LuxSci's Email Archival provides permanent, immutable email storage on servers in multiple geographic locations, updated in real-time, with weekly backups made to optical media. See our complete backup and restore statement for additional information. The LuxSci "Maximal Security" setting provides individual accounts with the highest level of email security. Security includes implementing the 20 minute WebMail timeout maximum, forcing appropriate outbound encryption, setting password strength requirements, and forcing secure logins. LuxSci support manually reviews any account needing to be HIPAA compliant and ensures that the Maximal Security setting is locked down so these security settings cannot be altered. Though disabled by default, administrators can choose to allow users the option to opt out of SecureLineTM encryption for a particular message. However, the user must explicitly agree that the message they are sending does not contain any ePHI. All messages sent without SecureLineTM encryption are logged for auditing purposes, and copies of them can be sent to an auditor email address for review. Opt Out is available both in WebMail and for messages sent via email programs using our SecureLineTM Outlook Plugin or via adding opt out content to the email subject line. LuxSci can provide a Virtual Private Network (VPN) connection to further secure access to our email, web, and database servers. LuxSci supports many versions of all popular email clients (though we recommend using the latest version of each product if possible), both licensed and shareware. If you use a lesser known email client, we should be able to help you configure it as long as the program supports either IMAP or POP, plus SMTP. Blackberries, iPhones, iPod Touches, iPads, Android and Windows Mobile are some of the more popular mobile devices available to professionals. LuxSci supports all of these phones, as well as any other phone that properly supports the IMAP, POP and SMTP protocols. If your phone doesn't support these protocols but does have a mobile web browser, you have the option to access your email using LuxSci's Mobile Site. LuxSci's Mobile Sync service includes "Push Email" for email viewing, real-time pushing of new email to your device, as well as for sending of outbound email from your device through LuxSci's servers. Push email is good for mobile battery longevity and for getting notifications of new email messages as fast as possible. WebMail is designed to work much like a desktop email program. LuxSci's WebMail interface ALWAYS gives you secure access to your email from any computer or mobile device with Internet access (via SSL with Extended Validation) unless you specify otherwise. WebMail is fully supported in Internet Explorer, FireFox, Opera, Safari, and Chrome. Our Mobile Site, which is a lightweight version of WebMail, is ideal for accessing email using the browser in your mobile phone or for extra security, privacy and simplicity. WebMail supports Two-Factor authentication (simple via a Google Authenticator, text message, email, or advanced via integration with www.Duo.com), IP access restrictions, and more. Blazing Speed: If you have a slow Internet connection or limited bandwidth, the Mobile Site offers faster service. It has been optimized to use less bandwidth, which makes the pages smaller in size, faster to download, and easier to read on your mobile device. Mobile Devices and Narrow Screens: The Mobile Site will work with almost any mobile device, tablet, or PDA that has a web browser. We work tirelessly to ensure the quality of Mobile site pages, especially on smaller screens. We provide you with online tools for creating, deleting, renaming, managing, and searching your email folders. Remove Duplicates: Configure removal of duplicate messages in any folder based on message ID, subject, sender address and size. Message removal can run automatically on a nightly basis or manually at any time at the push of a button. Auto-deletion: Configuration options allow you to automatically remove "old" messages in any folder to: 1. Reduce the folder size to some fixed maximum 2. Reduce the number of messages in the folder to some fixed maximum 3. Eliminate messages older than a specified number of days. Auto-Archival: Archival options can be designed to your specific needs. The function can occur as you prefer; daily, weekly, monthly, bi-monthly, yearly or when YOU feel the folder has exceeded desired storage size of message allotment. You can even have a folder auto-archived; which will move messages to a new dated subfolder at your convenience. Offline Storage: Download your email folders as ZIP-compressed archive in UNIX- or EML-format for offline storage. Create, rename, move, and delete folders and directories. Concurrent Access: Makes it easy to share access to email by allowing multiple users, using different email clients, access to the same email folders concurrently without issue. When composing email messages, WebMail will automatically give you recipient suggestions by searching all of your address books for matches; in the name, company, email and nickname fields. You can alter, eliminate or add to these suggestions via keyboard or mouse. This WebMail feature makes it quick and easy to enter recipient email addresses and avoid making errors. WebMail signatures allow you to add personality to your email. In addition to adding a signature to the end of your messages, you can customize the sending name and address. This is ideal if you have many different email addresses [not all of which are hosted at LuxSci] and need to send email (from a single WebMail application) that appears to come from any one of them. Unique signature technology; similar to other services' "personalities". Each signature has independent HTML and plain text versions. With Signatures you can include files that will attach to all messages sent using those signatures (e.g. add a vCard or a PDF with all messages). Determine whom your email appears to be from (you specify the From address and name; From name can be in any language). Determine to whom replies to your email will be sent (you specify the Reply-to address). If you reply to an email, WebMail will try to match the recipient address of the email to one of your signatures so that you automatically use the right signature for the right email -- no mistakes. Change your signature "on the fly" in WebMail and have the signature content automatically updated in the message. Use signatures either at the top of or at the bottom of replies and forwards. Use of signatures to send emails forged with addresses that you do not have permission to use is a violation of our Acceptable Use Policy. View messages encoded in any language or languages. Compose messages in any language or languages. Configure default encodings to use when none are specified. Support for encoded content in subject and sender name fields. UTF-8 Unicode is used throughout our site. Our user interface is translated into many different languages. LuxSci WebMail is designed for optimized work with dozens of languages such as: English, Spanish, French, German, Russian, Chinese, Japanese, Korean, Swedish, Hebrew, Portuguese, and many more. International Email Support: Send and receive secure email in any language or character encoding. Support for multiple character encodings in one message. Security: WebMail is fully integrated with our SecureLineTM end-to-end email encryption service. Automatically checks for new email in multiple folders. Spell checking in real time as you type. This feature supports multiple languages and customized user dictionaries. (Uses the SCAYT Text and HTML spell checking technology from SpellChecker.net. Defer email messages: hide messages in any folder and have them re-appear at later scheduled times for action. WebMail composition: Auto-save your work so you never lose a message in progress. Address Books, personal and shared, are integrated with WebMail. Many, many more -- get a Free Trial and see them all. Searchable, sortable, and downloadable reports of the state of delivery of every message to every recipient. You can see what has been sent, what is still queued, what has been delivered successfully, what has failed ... and exactly why. Reports include the reasons messages may be delayed, exactly why they bounced, and what the recipient servers said when they were delivered. Aggregate reports give you overall delivery statistics on a daily and monthly basis. LuxSci provides SMTP Relaying so that you can send email from email programs (WebMail does not require "SMTP" service to send email). Alternate Ports for secure and insecure SMTP -- including port 80 -- which is open in most firewalls. All of our email servers support TLS and will talk securely with other servers whenever possible (opportunistic TLS). [Optional] Configure DKIM for the domains from which you are sending and get information to add to their DNS so that your recipients can verify your messages and improve their deliverability. Send copies of all outbound emails, from all users, to a designated email address. Certain users can be exempted from this process. Global taglines or disclaimers in text and/or HTML cab be configured to appear at the end of all messages sent by your users. Applies to messages sent via WebMail and from email programs using SMTP. Taglines/disclaimers can be added as attachments or added as part of the message content itself. Monitor the content of all messages sent from WebMail or from email programs using SMTP. LuxSci's authenticated SMTP services can be used as a "smart host", which allows users to relay all email from your internal server though our servers for processing before being sent out into the Internet. With smart hosting, you can take advantage of all of LuxSci's SMTP features, such as automatic outbound email encryption, anonymization, taglines and content monitoring. Our "Intelligent" Smart host feature treats your email as if it were sent by your individual users. It looks at the "From" address on each message, rather than the single user connecting to LuxSci's SMTP services. This permits enforcement of per-user SMTP limits, per-user reporting on SMTP usage, per-user customization of taglines, per-user exemptions from some tools, and full support SecureLineTM automatic end-to-end outbound email encryption. Intelligent smarthost is included with our standard SMTP service. Smart hosting for Office365 and G Suite is also supported. View your own plus your users' IMAP, POP, SMTP, and WebMail login and connection histories for up to 30 days if you have administrative access. Email auto-responders let you setup pre-defined responses to email messages that you receive while you are away -- out of the office, on vacation, or otherwise unavailable. They also allow for the configuration of complex automated response rules. Automatic response to incoming email messages. Configure responses based on arbitrary criteria such as: sender address, subject content, body content, email header content, etc. Sign the replies with your signatures. Specify the subject line and body of each reply. Activate and deactivate the auto-responders manually or set a scheduled time window for activation and de-activation. Enable "nags" to notify you that your responder is still enabled after a specified date. HTML-formatted or plain text-formatted response content. Configurable time window during which senders will not get duplicate responses for multiple messages sent. Rate limits so that the same sender does not receive too many responses from you and so that your responders cannot be used to create denial of service situations. Customer-accessible audit trails of all responses sent. Includes when, to whom, for what responder, and what the subject of the original message was. An email alias is not an actual user, but rather a rule that indicates to whom the email should be delivered. Individual users can also configure email forwarding for their inbound email. Catch-all aliases to capture email to non-existent address at your domain. Redirect email to any address at your domain to one or multiple real local or remote email address(es). Redirect email to multiple addresses at once. (Limit: 25 addresses or the number of users in your account, whichever is larger). Lots of aliases; change them anytime you wish via our secure online tools or our API. Domain Forwarding Catch All Aliases allow you to forward any address at one domain, "domain1.com", to the same user at a second domain, "domain2.com". Powerful Alias Manager has search features that allow easy management and reporting on thousands of aliases across hundreds of domains. Aliases can: forward email to one or more recipient addresses, send custom email bounce messages, and automatically delete all incoming email. User Groups WebAidesTM can be used to create and manage distribution lists to selected groups of users in your account. If you have other email accounts with POP access, you can download messages from these remote accounts to your LuxSci email folders. Use your inbound email, anti-Spam, and anti-Virus filters, including Premium Email Filtering to filter downloaded messages before forwarding to your LuxSci account. This is a great solution when your remote email account doesn't permit email forwarding but you want to download and filter those messages. Delete or leave the remote email on the remote server when downloading manually. Messages are deleted from the server with automatic message downloads. Optionally preview messages before downloading: select what to download or delete. Download email from one or ALL remote accounts individually or at once. Secure POP (SSL) connections to remote POP servers. Use "Signatures" to manage multiple email accounts. Full support of previewed email messages with text in most languages. These email alerts are HTML for easy reading and include a CSV (Excel) file with all of the data for easy analysis. With these reports you can always be aware of failed deliveries and do not have to worry about getting and reading bounce messages. You can configure these reports so that managers can get copies of the failure reports for users and thus can ensure that important messages are all properly delivered. We collect spam complaint reports via agreements with major ISPs to detect spamming and other issues quickly and to help keep our servers off of black lists. Users and administrators can see reports of SPAM complaints in our web interface. Users and administrators can also have digests of their received SPAM complaints automatically emailed to them (with detailed information in attached CSV files) so that they are made aware of issues as soon as possible and to make opting complaining recipients out of mailing lists quick and easy.